Looking for a protein that tastes good that will help you reach your goals, while being economical? 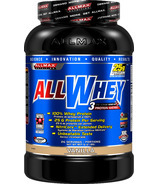 Well, ALLWHEY delivers it all! ALLWHEY combines the latest innovations in Whey Protein and delivers 100% Whey Protein per serving, which is made possible through a new extraction technology, called NitriCore.